One of those guilty pleasure flavours for me is a nice bunch of buffalo chicken wings dipped in some blue cheese. Mmmm, goodtimes. So there had to be a way to make these flavours happen but in a healthy and easy way. I had at one point thought of chicken fingers but the coating got in the way. Then my husband suggested grilling. Tada! There it was. Ofcourse the blue cheese dip being a dressing, it was only natural to just make it a salad then. Nummy wing night flavours, far less naughty. Totally win win I say. There is a lot of salad there, I had to put it in my udon bowls! Just combine those up and let them sit. Makes about 1 cup of sauce. Each 2 tbl serving is 49 calories, 0 grams of fat, and .1 gram fiber. Glaze the chicken with the Buffalo sauce and grill or cook with desired method. Cool the chicken for 5 minutes, slice the chicken, and toss again in some more buffalo sauce if you like a saucy wing like I do. Toss a salad with some lettuce, grated carrots, and low fat blue cheese dressing. I use president’s choice blue menu blue cheese dressing. Very nummy and I don’t usually like diet salad dressings. Top with the chicken and serve! Good times. So based on approximately 1 cup of salad, 1/4 cup of grated carrots, a couple of tablespoons of blue cheese dressing, a serving of buffalo sauce, and a chicken breast. Each serving of this salad is 258 calories, 7.6 grams of fat, and 1.8 grams of fiber. Not too bad for a wing night I say! Ofcourse, feel free to increase those lettuce and carrot portions they won’t hurt you one bit! 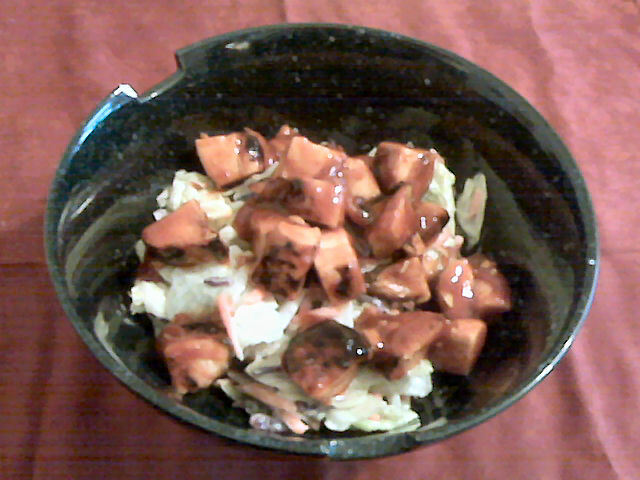 This entry was posted in Comfort Foods, Craving Buster, Dinner, Lunch and tagged Chicken, Salad. Bookmark the permalink.